The smallmouth bass is one of North America’s most popular fish. 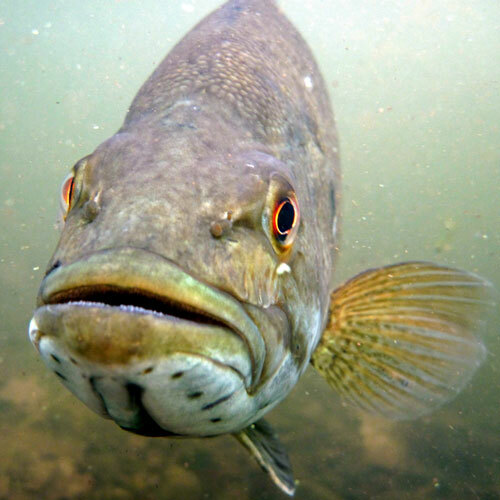 As their name implies, this fish’s mouth is somewhat smaller than its cousin, the largemouth bass. Otherwise these fish are similar, although typically browner and smaller in size. Smallmouth bass are also known as red eye bass, brown bass, or bronzebacks. Smallmouth bass are found in rivers and clear lakes, usually over rocky or gravel bottoms, where they prey on crayfish and other invertebrates. Smallmouths often orient to pools and ledges during the cooler months, but may be found in grass beds or other environments during summer. In lakes, smallmouth bass often visit shallow areas during the early morning and move to deeper water as water temperatures increase. They are known for orienting to structure and shade. Smallmouths often lurk near sand bars, submerged islands, points, drop offs and weed beds. Smallmouth bass are often found together with their relative, the rock bass.